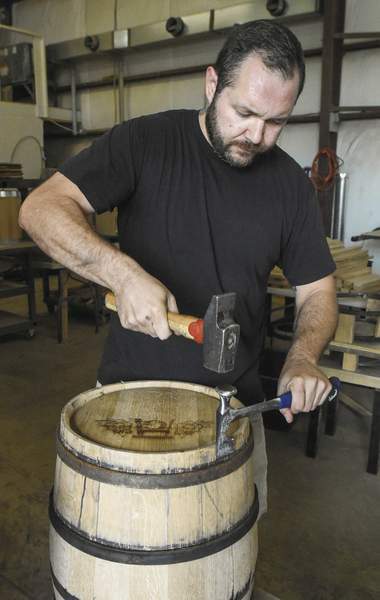 Photos by Michelle Davies | The Journal Gazette Matt Lipsky ditched his life as a bartender in Chicago to make whiskey barrels at his company Anne-Grey Cooperage. 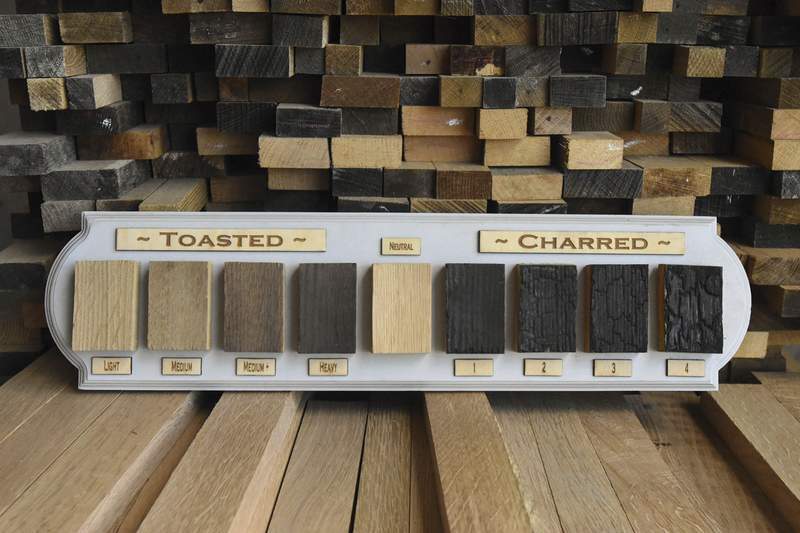 Degrees of a barrel’s toasting and charring are displayed. Toasting is used for making wine, while charring is used for whiskey. One of Lipsky’s barrels is charred to a client’s liking. The level of charring is what gives whiskey its color. Barrels can feature plexiglass or glass heads so the liquor inside is visible. Lipsky taught himself to build them and learned perseverance along the way. “There was a lot of failing,” he says. 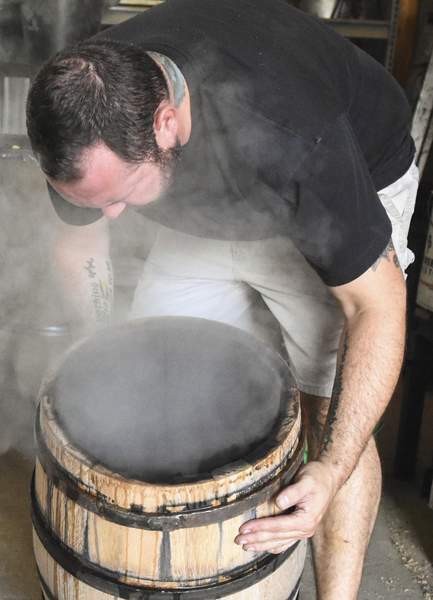 Michelle Davies | The Journal Gazette Lipsky checks the level of charring of one of his barrels. If a barrel is too charred, it becomes useless and must be thrown out. 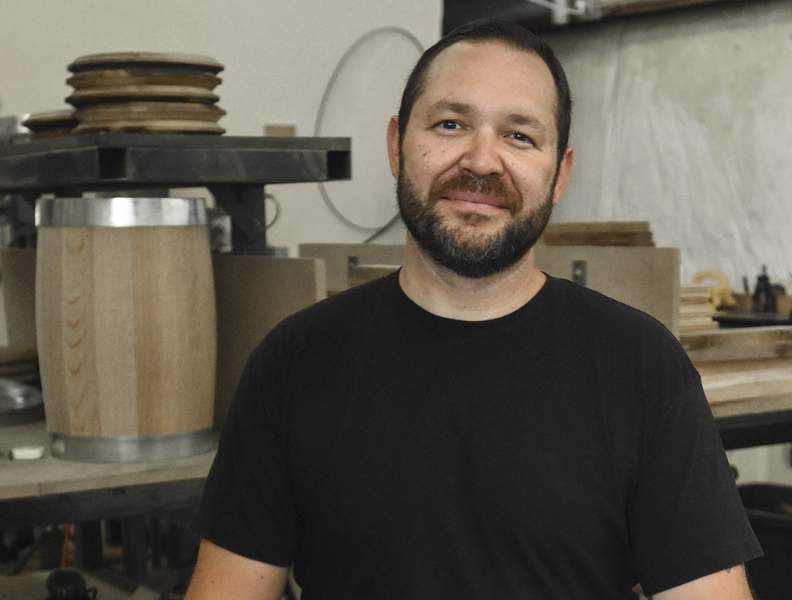 Michelle Davies | The Journal Gazette Matt Lipsky pounds on trussing hoops to make sure they are tight as he makes a whiskey barrel in his Fort Wayne shop. It's the difference between 15 seconds and 16, the difference between a really great glass of bourbon and a bitter glass of liquor. It's that difference, the fine line, that has Matthew Lipsky standing behind his shop on the northwest side of Fort Wayne with a stopwatch in one hand and a hose in the other, watching the flames tower over him. The one second could mean the difference between a perfectly charred bourbon barrel and one that's unfit to use, flakes of ash and soot falling to the bottom, destroying six hours of work. The morning light peeks through the buildings of the nondescript industrial park off U.S. 33. Clad in a pair of cargo shorts, T-shirt and sneakers, Lipsky carries on a conversation in front of Anne-Grey Cooperage. Behind him, the garage door is open and a pile of wood lies on the floor. It looks unassuming, like any other lumber, but it is white oak, seasoned three years in open air, and the start of what will be small-batch spirits barrels handcrafted by Lipsky. 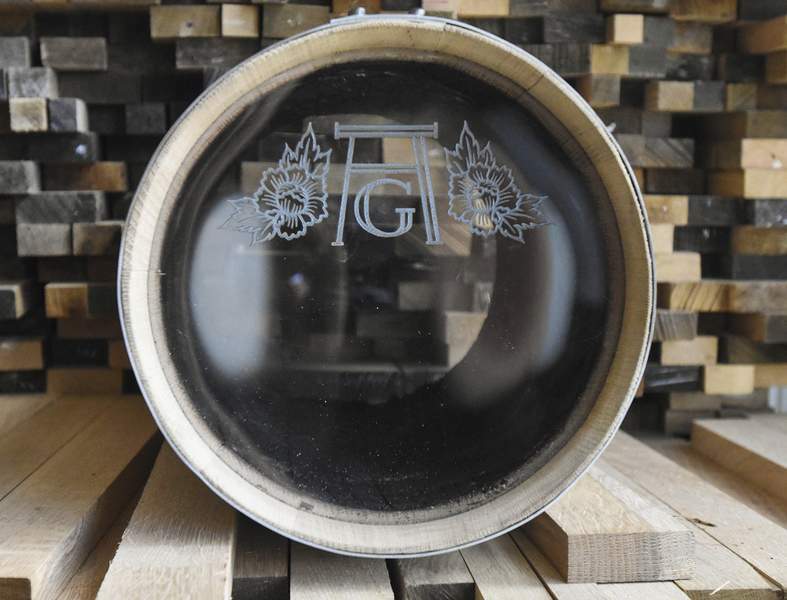 Anne-Grey Cooperage, which has been in business about a year and a half, produces 1.5-liter, 1-gallon, 5-gallon and 15-gallon barrels for craft distillers in the area and across the country. 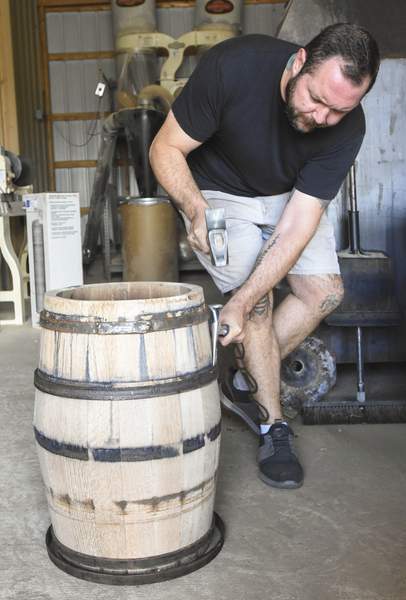 From Three Rivers Distilling Co. locally to Edwin Coe in Churubusco to Oakley Brothers Distillery in Anderson, Lipsky is providing barrels to support the growing craft spirits movement. Everything is done by hand, and what isn't is done with machines that Lipsky fabricated himself for the cooperage. “We still hammer our rivets by hand on an anvil, an anvil from the 1850s,” Lipsky says. “Everyone (else) uses hydraulic presses. The man in the picture, the one with the navy suit, striped shirt and paisley tie, is posed casually but professionally. A small smile crosses his face, and his hands are folding gently in his lap. The man in the picture, staring out from a post on Instagram, is a different person, Lipsky says. And yet, it is him. “I lived in Chicago for a long time, where I was a different person,” he says. Working for high-end restaurants and swanky hotel chains such as the SoHo House, the Texas native went to work in suits and ties with $500 shoes on his feet – a far cry from the person standing in Anne-Grey Cooperage. He spent his time managing people, tasting and scoring independent spirits for the Beverage Tasting Institute and lecturing about whiskey. He would fly to Scotland to sample and select whiskeys for independent bottlers, who would bottle the scotch and sell it. His interest in spirits began when he was living in Fort Worth, Texas, making a living as a freelance artist, when he picked up a weekly bartending shift by chance. The neighborhood bar, a place where you would order a beer and a shot, was close to the art museums and Lipsky was a regular. While he didn't have any knowledge of bartending, he quickly picked it up and began to study up on the differences between spirits and what makes bourbon, well, a bourbon. Looking for a more upscale bartending scene and encouraged by a friend in the Windy City, he sold most of his possessions, packed up his Jeep and headed north. But life as one of the “it” bartenders in Chicago doesn't just come with a wardrobe expense and the chance to serve celebrities such as Katy Perry and Harry Styles. There's stress and long hours, and it's a lifestyle that's not always accommodating for a family. “We had a kid. That's the story right there,” Lipsky says matter-of-factly. The decision to leave Chicago came down to whether Lipsky and his wife, Patti Nix, wanted to raise their daughter in the city or in the place where Nix had grown up. The pair could have opened a restaurant or bar, as Nix also worked in the bar industry in Chicago, but for Lipsky, there seemed to be an obvious progression. There are no books on coopering, the process of making a barrel. There's no “coopering” major and what was traditionally a long apprenticeship; it's now challenging to even find someone to learn from. So Lipsky had to teach himself. He watched Japanese YouTube videos and learned about different schools of coopering. He scoured the internet to find any bits of information that he could piece together. He even found a couple of basic classes at Tillers International, a nonprofit based in Scotts, Michigan, that funds educational farming practices in Africa. It took Lipsky months before he could make a barrel in a production manner. But once he was able to create one barrel, one water-tight, rounded vessel that began as a flat piece of wood, he took it to Three Rivers Distilling Co. While he was hoping to just sell the barrel, he was able to create a relationship with the founders, and the support enabled him to begin Anne-Grey, a name that is a combination of his wife's and daughter's middle names. The cooperage can produce up to 100 barrels a month, but it varies depending on orders. But each barrel starts as a piece of lumber in the pile like the one on the floor of the building. Lipsky “blanks” it, making it square, before creating a stave. The staves are the planks, so to speak, from which the barrel is made. Lipsky also has to make the top and bottom caps to the barrel, creating notches for the heads to sit in, and the hoops, which are made from metal. “We have machines that are big, but it's definitely an art form. We don't have it down to a science,” Lipsky says, adding that most of the machines were fabricated in-house, specifically for coopering. 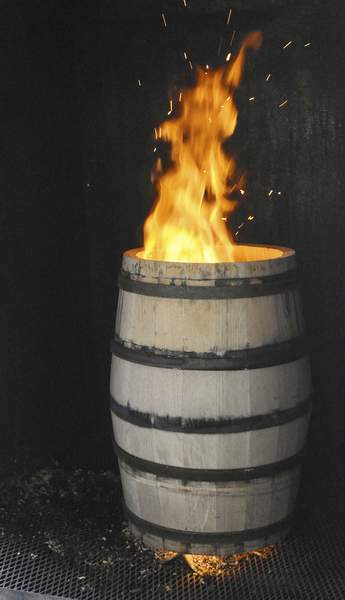 A barrel, which is usually made in a group, can take six hours to make before it meets the fire outside the building. Distillers can choose whether it's toasted or charred, but 100 percent of the color comes from the barrel, and most choose the darker finish. The shop is three hours away from Chicago, but to Lipsky, timer in hand, it's a world away – and one he doesn't regret leaving. “I have to be creating something. I think it's just my personality,” Lipsky says. “Whether it was art on a piece of clothing or art on a canvas or art in the form of beverages, making cocktails ... everybody needs an outlet.